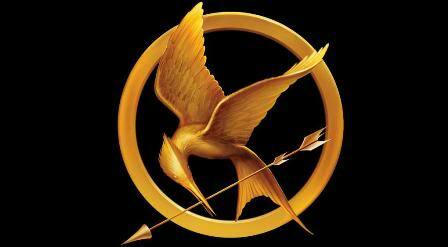 With the release of The Mockingjay last Aug. 25. the trilogy finally comes to a close. I really, really, really love this trilogy! Words escape me if asked how would I describe it. Some may say there is a certain brutality to the Hunger Games but I say GO READ THE BOOK FIRST! read it and then come back to me after you've done so, then we'll talk. found it!.. yeyy.. yeah the book is awesome.. it was weird at first coz i've been caught up reading vampire books(i have read like 3 different vamp books already) and i kept waiting untitl katniss or gale or peeta or any of the characters to reveal that they're actually vampires.. LOL.. i love how the story is so futuristic.. i totally love Katniss Everdeen.. i'm not done with the first book though.. not yet.. T_T.. got lots of thing going right now.. i have little time to read..
sooo...what team are you? Peeta or Gale? and what other vampire books have you read? "may the odds be ever in our favor"
--the last book we have read was the Vampire Academy Series and i wasn't that happy with it. The story is good, but damn, rose hathaway really gets on my nerves. --So far, i have read the Twilight Saga, the Blue Blood Series, and the Vampire Academy Series. --i'm nowhere near the end yet.. i'm still in the part where Rue just died.. so sad.. i only got few hours to read everyday. --I have this big career exam to take in a few months and i gotta be prepared. Yep, I have read the Evernight series. It's ok I guess but with all the vamp books popping left and right. I guess I am done with it, although I am not totally closing my doors, something really good might come next. I have read the Twilight Saga, Sookie Stackhouse series, Vampire Academy, Blue Bloods series, House of Night series, etc. I've pretty much read every vamp book in YA literature these days! LOL. I read a lot because it's my job, I do book reviews for a members only site that caters to book readers of different genres. I am lucky to be assigned to the YA category. I love what I'm doing! So if you have any questions about a particular book, you can ask me. Ohmigosh...I cried at that part too. Rue was so small. Her death was really sad. Don't worry if you don't get much time to read. You'll eventually get to finish the book anyway. Take your time. What exam are you going to take? --oh gosh, you have an awesome job! its good that you love what you're doing..
--i'm taking the PNLE this december. --so the Hunger Games book 1 is the last book i'll be reading for now. i'm gonna focus on what matters first and then after the exam, i can read whatever book i want..
for those who haven't read the series yet.... SPOILER ALERT!!!! well honestly it's going to be a rough ride. Katniss herself cannot decide whether she should choose Peeta or Gale, I guess she is just to busy with the threat hanging over her head. In the second book, she and Peeta will get thrown together again in another arena. Needless to say, Peeta will show what a great guy he is. In Mockingjay, it will be all war so there won't be much time for romance although Katniss is showing a bit of hint as to who she might end up with. And yes it will be Peeta but it is a very bitttersweet ending. Goodluck with your upcoming exams. Hope you pass it! Thanks for the spoilers too!.. ^_^.. nice to know katniss chose peeta.. yeyy..